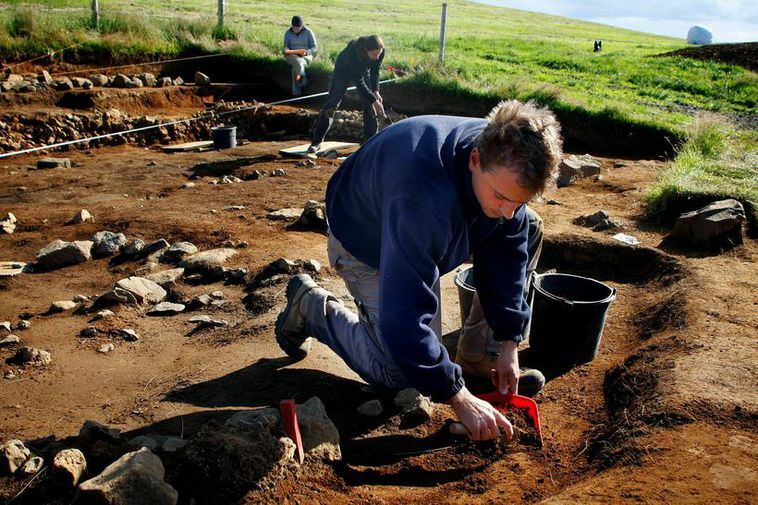 A church, longhouse and a barn from the 10th and 11th century were excavated in an extensive archaeological excavation at Hrísbrú in Mosfellsdalur, South West Iceland, in the years 1995-2005. A group of people want to make more of these remains, to make this heritage accessible. They have sent in a formal request to Mosfellsbær municipality to build a house, a church, a smithy and a scriptorium by the excavation. The houses will have a live display on how life was in 1150 Iceland, with craftspeople go about their business like they used to all those years ago. There area also plans to build a restaurant and a souvenir shop. The aim is to do relay a time in Iceland's history which the group believes to be the height of Icelandic culture, the Middle Ages. The farm at Hrísbrú was likely the home of a chieftain, as it was very grand for its time. It's also believed that Egill Skallagrímsson is buried there, one of the heroes of the Icelandic sagas. "There have never been as many tourists in Iceland as there are now. The increase has been rapid and diverse destinations are sorely lacking. Most of the tourists stay in Reykjavik or close to the city, so the biggest need is in that area," it says in the application. The group expects that 70.000 people will visit the chieftain's hut each year, and hope that in time it can be one of the favoured destinations of the Golden Circle.